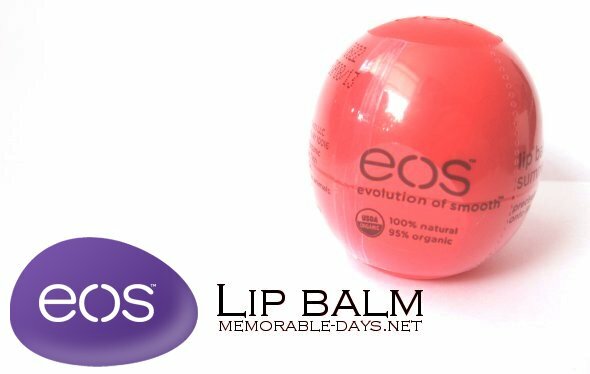 Review: EOS Lip Balm - Summer Fruit | Memorable Days : Beauty Blog - Korean Beauty, European, American Product Reviews. A lot of people have been raving about this lip balm since 2009 and some of my followers recommended this product to me, so I decided to buy it and give it a try. 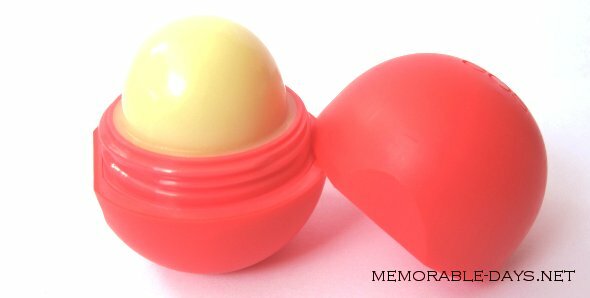 Today I will review the Evolution Of Smooth (EOS) Lip Balm - Summer fruit flavor. They have five other flavors which are Sweet mint, Pomegranate Raspberry, Medicated Tangerine, Lemon Drop with SPF 15 and Honeysuckle Honeydew. I'm loving the packaging of this lip balm. It's so cuteee! It has an egg shape and it's pink! Besides, it is easy on the grip and easy to open because of the rubber non-slip container. The lip balm itself is yellow while it's white on the picture of their website >.<". The packaging smells like rubber (duh! because it has a rubber packaging). When you twist the top off you will smell something chemical. However, the lip balm itself smells very nice and fruity, it's so nice that I almost want to eat it hahaha ='D. I bought it for $5 on sasa.com which is quite expensive for a lip balm. However there is 7 oz in it, which is a lot. I think that it will last for a year or so. Twist off top. Pucker up. Smooth on. Smile :). My previous lip balm was the vaseline pocket size which has a sucky/ non-hygienic packaging. This packaging is way better than the vaseline pocket size since I don't need to apply the product with my finger. The EOS lip balm is 95% organic, 100% natural and paraben, phthalate, gluten and petrolatum free. Packed with antioxidant-rich vitamin E, soothing shea butter and jojoba oil. I'm LOVING the packaging and the scent. That's probably the reason why most of the people like this product so much. I really thought this was super moisturizing for my lips, but it only moisturizes for approximately 2.5 hours, so I need to re-apply it quite often =(. Therefore, I won't recommend this to people with very dry lips. Will I purchase this again? Hmm.. Yes, because I'm a sucker for cute packaging \^o^/ and the scent is just so nice! Besides I do think that this product is worth the $5, since you can use it for a year. I probably would try a different flavor though, like the lemon drop with SPF 15 for in the summer :). i love the packaging too !! Ik heb deze ook en ik vind het een 'okay' lipbalm. Het werkt niet zo heel goed als je extreem droge lippen heb omdat EOS niet vettig is. Dat is wel een minpuntje.. Ik heb de mijn in US gekocht en daar koste het $4. @siwing, yeah, it's around 3.25$ on their own website, but the shipping is just way too high o_o!! @Ice pandora, totally agrees.. vaseline en labello is veel meer hydraterend en dus wat ik bij me review schreef het hydrateert maar 2.5 uurtjes. niet lang dus =( maar de fruity smell en verpakking is echt <3 LOVE ! Thanks so much for the review - I was planning on picking up one of these when I went to San Fran next month, and now I think I might get two! @Anonymous, that sounds nice =D ! !